Mix all spices together in a large mixing bowl. Once mixed, reserve two tablespoons and set aside. Take 1 steak and insert into the bowl of mixed spices. Gently poke holes in both sides of the steak with a large fork, careful to go only halfway into the steak, allowing the spices to get into the meat on both sides. Repeat with the remaining steaks. Be sure to coat the steaks well with the spice mixture.Take a large, clear container and add half of the chopped onions and fill halfway with vegetable oil. Place the steaks in the container, add the remainder of the chopped onions and completely cover with the remaining oil. 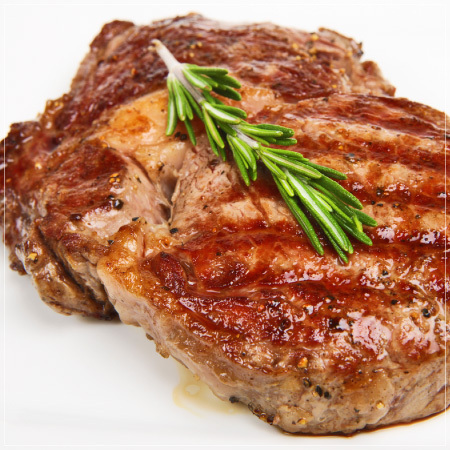 Place container in refrigerator and allow steaks to marinate for 48 hours. After the steaks are fully marinated, gently heat up the butter in a small sauce pan until it becomes a clear liquid and stir in 2 tablespoonsof the reserved spice mix. Grill steaks to desired doneness and placeon serving platter. Gently brush the heated spice and butter mixture over the steaks.